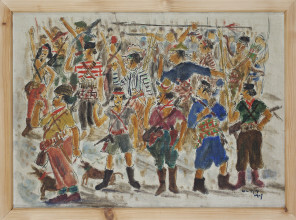 In 1947, at the height of the Indonesian struggle for independence, director Willem Sandberg staged the first exhibition of the Indonesian brothers Agus and Otto Djaya in the Netherlands. It was also the first solo presentation of contemporary non-Western artists at the Stedelijk. The work of the Djaya brothers focuses on the Indonesian fight for independence after the nation was declared the Republic of Indonesia in 1945. Research conducted by the museum last year into the brothers’ presence in the Netherlands, sheds new light on their activities. These new insights inspired an intriguing exhibition that fills two galleries, a symposium, and other activities. New research carried out by independent curator and researcher Kerstin Winking into the work of the Indonesian Djaya brothers in the collection of the Stedelijk Museum Amsterdam reveals the presence of a significant amount of materials on the brothers in Dutch archives. Between 1947 and 1950, Agus and Otto Djaya were in Europe, primarily the Netherlands, involved in a secret mission to promote the cause of the Indonesian National Revolution. During this time, they produced a number of paintings, a selection of which are on view at the Stedelijk. 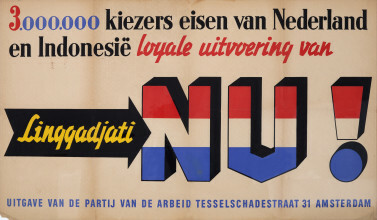 In conjunction with works from the collection of the Stedelijk, the National Museum for World Cultures and Leiden University Library, the exhibition also features archival material that shows how closely art and politics were interwoven, that the artists were under surveillance by the Netherlands Government Information Service, and that the Djaya’s and their support of independence received the backing of Dutch intellectuals. When the Djaya’s arrived in Amsterdam in 1947, they already had a network of local contacts, including the Leiden-born professor and curator of the Indisch Museum (now the Tropenmuseum) Theodoor Galestin, professor of non-western sociology Willem Frederik (Wim) Wertheim and museum director Willem Sandberg. The brothers had brought many of the 126 paintings and drawings that Sandberg exhibited at the Stedelijk with them from Jakarta, stowed in the cargo of the steamship on which they travelled. Examined against a background of the four-year war between the Indonesian independence fighters and the Dutch colonial regime, this exhibition invites new research. Why were the Djaya’s in the Netherlands and not in the interior of Java like most of their revolutionary artist-peers? Why did curators like Willem Sandberg and Theodoor Galestin research, present and collect the work of the Djayas? What documentary evidence can be found to explain the presence of the Indonesian artists in the Netherlands? The Djaya Brothers: Revolusi in the Stedelijk examines the work of the Djayas and places their presence in the Netherlands in a broader context. It highlights, for instance, the fact that the work of Agus Djaya and Otto Djaya was a synthesis of Hindu-Javanese traditions and modern western art, particularly the work of the European Expressionists and French Modernists. In addition to unusual water colours and paintings, the exhibit also features objects from archives in the Netherlands, including catalogues and photos of the artists taken by the Netherlands Government Information Service. The Stedelijk also features work from its collection by other revolutionary artists such as Mochtar Apin and Baharudin, and Henri Cartier-Bresson’s photos of the inauguration of Sukarno, the first Indonesian president of the Republic of Indonesia in late 1949, the exit of the Dutch soldiers. Writer Reggie Baay has researched visual culture in relation to the Dutch colonial past for many years. He studied at the University of Leiden where he specialised in colonial and postcolonial history and literature, with a special focus on the former Dutch East Indies and modern-day Indonesia. He is the author of the highly-praised books De Njai; Het concubinaat in Nederlands-Indië (2008) on Asian concubines in the Dutch East Indies, and Daar werd wat gruwelijks verricht (2015), on the forgotten history of slavery during the Dutch colonial regime. His latest publication, on the period of Indonesia’s decolonisation, is due for release in September 2018. Kerstin Winking is the guest curator of the exhibition The Djaya Brothers: Revolusi in the Stedelijk and will talk about the more obscure layers of meaning in the oeuvre of these revolutionary Indonesian artists and share the stories and rumours surrounding it. Kerstin is an independent curator and researcher based in Amsterdam. Her work focuses on artistic practices that explore geopolitical relationships and is informed by critical theory and postcolonial discourse. Her work at the Stedelijk Museum includes research and exhibition projects such as Africa Reflected (2010), Project 1975 (2011-2012), and Global Collaborations (2013-2015). The idea of modern Indonesian art was the subject of debate amongst artists, writers, and politicians from about 1935 and 1950, and coincided with anticolonial and independence struggles, and the questioning of broadly accepted notions like ‘East’ and ‘West’. The symposium will particularly focus on the years of the Indonesian National Revolution (1945-49). During this decolonization period artists took on the significant role of visualizing the revolutionary spirit of the time. This symposium will illuminate the positions of the central figures of this debate, and approach them from contemporary perspectives of international cultural researchers. Speakers include: Antariksa (researcher and co-founder Kunci, Cultural Studies Centre, Yogyakarta), Amir Sidharta (art historian and curator at Museum Universitas Pelita Harapan, Tangeran and curator of the Presidential Collection of Indonesia, Jakarta), Mikke Susanto (curator researcher, lecturer at the Indonesian Institute of Art, Yogyakarta, ISI Yogyakarta and curatorial consultant of Republic of Indonesia Presidential Palace), Kerstin Winking (exhibition curator The Djaya Brothers: Revolusi in the Stedelijk, Amsterdam), Harm Stevens (curator history of the 20th century at the Rijksmuseum, Amsterdam), and Remco Raben (Professor Colonial and Postcolonial History of Culture and Literature, University of Amsterdam). On 27 December 1949, the Netherlands officially transferred sovereignty to the Republic of Indonesia. This recognition marked the end of the Indonesian National Revolution (or Indonesian War of Independence) that was fought against the Dutch colonizers. Soon after, a group of Indonesian writers led by Asrul Sani published a manifesto in the popular magazine Siatat on the importance of artists in the development of a ‘world culture’: “We are the legitimate heirs to world culture, and we are furthering this culture in our own ways.” This manifesto will serve as a guideline during this one-day summer school on Culture, History and Historiographies in Indonesian Art. The course will not be limited to a particular history of Indonesian modern art, but will examine a set of histories, methodologies and foremost, historiographies. Aminudin TH Siregar is a Lecturer in Indonesian Art History and Art Critic at the Faculty of Art and Design, Institut Teknologi Bandung (ITB), Indonesia and is a Ph.D. Candidate in Area Studies at Leiden University, The Netherlands. Thomas J. Berghuis is an independent curator and art historian, currently working as a part-time lecturer with the University of Amsterdam. Berghuis’ research practice focuses on art in China and Indonesia. The exhibition The Djaya Brothers: Revolusi in the Stedelijk is curated by guest curator and researcher Kerstin Winking in close collaboration with the team of the Stedelijk Museum Amsterdam. Kerstin’s research about modern and contemporary Indonesian art is supported by the AFK (Amsterdam Fund for the Arts).